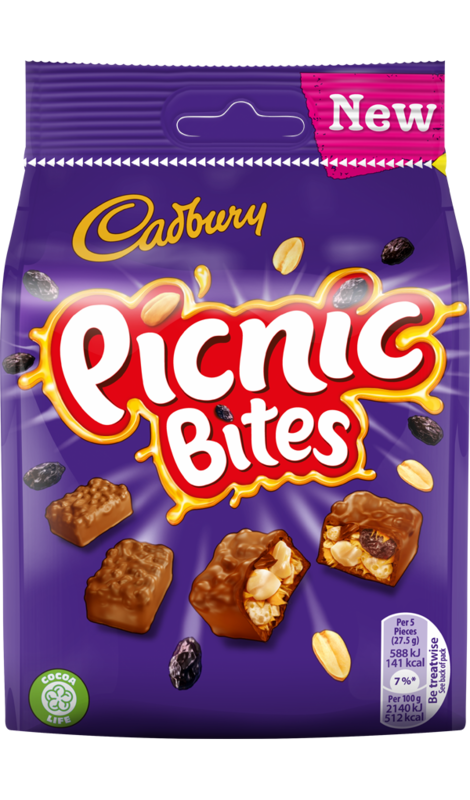 Nobbly nibbles of crispy cereal, chewy caramel, crunchy peanut and juicy dried grapes, all wrapped in Cadbury milk chocolate – tasty treats by the bagful! Sugar, PEANUTS, glucose syrup, vegetable fats (palm, shea), dried grapes, WHEAT flour (with added calcium, iron, niacin, thiamin), skimmed MILK powder, cocoa butter, cocoa mass, whey powder (from MILK), MILK fat, emulsifiers (soya lecithin, E476, E471, sunflower lecithin), salt, flavourings (contain peanut), rapeseed oil, anticaking agent (E170), BARLEY malt extract, raising agent (E503). May contain nuts and egg.